Well, I mean, isn't that the struggle of playing in a league that isn't one of the Big 5? Unless some Sheik shows up willing to plow a kerbillion dollars into your club (and even then), you just can't match the kind of money (and prestige) even mid-tier La Liga clubs can offer. Trying to build a consistent European power outside of the Big 5 leagues is probably the biggest challenge in the game. I'm sure I watched a video where someone made all the teams of the Scottish Premier League super rich and 1000 years into the future the league's overall rank didn't exactly jump that high. I think it went up, but the established leagues still pretty much remained at the top. Oh absolutely, and it's totally me. 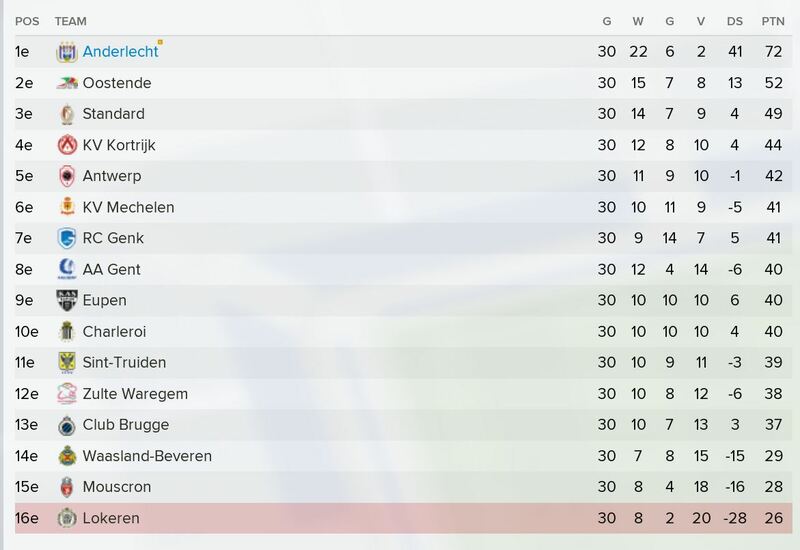 I never had the ambition to win the Champions League with Anderlecht, just not running the club as asinine as its real-life counterpart was and is enough. I guess this game hits me with both the dopamine and cortisol... I love the tweaking and long-term planning, the tactical fiddling and of course feeling smug about doing better than real life Anderlecht. But it's catnip for my micro manager side, as I find myself procrastinating within the freaking game's vastness itself. Which hinders my progression towards the long-term reward thing. And I loathe losing and not being able to draw a clear line between cause and effect. So yeah, I'm a control freak too, which stops me from going on vacation until the end of the season. If it's any consolation, I absolutely loathe losing as well, and it's only this year that I've managed to be "okay" with using a team that appears to be doomed to relegation and I can't see how to turn around. Season 1 is down! Fulham finished a perfectly respectable 12th, well clear of the relegation fight. As mentioned, we made the Semi-Finals of the EFL Cup, but had a disappointing exit in the FA Cup to Reading. Now comes the tough part, as Tottenham apparently have eyes for Ryan Sessegnon, and a bunch of my players are looking for new contracts as rewards for staying up but the board hasn't given me THAT much extra money to play with (and a transfer budget of just $30M). How much of the money from selling Sessegnon would be put back into your transfer kitty ? I'm sure you already spend time scouring the loan market, but I can thoroughly recommend Patrick Roberts if he's available - you can plug him anywhere in AM. I've got my eye on Lovro Majer from Croatia. I love Tom Cairney, but he's not exactly the kind of AMC that's going to get you to the Champions League. No offer's come in for Sessegnon yet though, although the game did say that Bournemouth were planning a $50M offer for Mitrovic (Bournemouth!) and if they offer me that, I'll snap their hands off taking it. Out of curiosity, what do you set currecny/wages to? I, for years, only believed in judging players on a monthly wage, and and only in the past few years changed to a weekly wage. Be interesting to hear, as I still get taken back by hearing higher Euro amounts. Most recent was Allan's proposed move from Napoli to PSG (fell through) for 90m Euro. As an American, I'm most used to U.S. Dollars and yearly wages, because that's how we always talk about it here in the US. I tried doing weekly wages once a while ago, and I literally just couldn't wrap my mind around it, because I'm so used to how North American sports do it. To go back to this for a sec, is it feasible/possible to take some small club and turn them into Champions League winners in the game? The more I've played, the more that infrastructure and/or regional demographics seem to create long-term blocks that hold back a club's progression. You might be able to do it with a currently unsuccessful club which has good infrastructure, a large stadium and plays in a nation where you get significant TV income (say, Newcastle), but in a smaller country you just won't generate the revenue to buy better players or to keep the good ones that you develop. In my Celtic game, I won the SPL 4 times in a row (going unbeaten one season), but only got out of the PL groups twice and it wasn't looking any better. You can't get your rep up high enough to attract the best, young stars won't sign for you (although I could get them on loan), and any players I developed were snapped up for relatively low money because as soon as even a mid-tier Bundesliga club came in with a £12m bid for my best player, he was moaning when I turned it down. I couldn't offer mega wages to shut them up because even with a 60,000 stadium, the TV and prize money just made it unmanageable. So, just like real life then. You might get lucky with it. On one FM I managed to win the World Cup with Cameroon. The team wasn't anything special, but the results all went the right way, if I ran that World Cup again I am certain I wouldn't win it again. I played Argentina in the final who insisted on continuing to play the likes of Messi and Tevez when they were well into their twilight years. I was figuring it would have to be a club from England, Spain, Italy, France, or Germany. As you mention the top league in other countries just wouldn't be able to draw and hold top players. I'd be fine if it would work in one of the five major countries though. I was thinking it'd be the ultimate achievement to take some tiny English club up five leagues, into the Champions League, and then win it. It used to be very possible in older versions, before SI spent a couple iterations tidying the financial side of the game. I've won the CL with St. Albans, Cambridge City, Barnet and Telford. Back in those days you could massively over-spend and then catch up to your obligations with consistent promotion. Now the game features many more hard limits on spending and it's much harder to shield your good players from other teams. People still manage it - I see the screenshots - but it takes much longer. I guess another issue is that the various leagues and UEFA have brought in FFP rules, designed to keep the existing hierar....err, designed to ensure clubs don't overspend on wages etc compared to their income. That's certainly the case in the Championship in England, although I'm not sure whether the same is the case in other countries. That certainly puts the blocks on smaller clubs shooting through the divisions, as they have to effectively pause in order to have their crowds and other income catch up with their new stature (and also potentially expand stadia etc). CM 97/98 is the last one I managed to reach the Champions League finals with Anderlecht, only to lose to Ajax. It's a combination of the game getting more realistic in hundreds of little ways, and TV money. Back then, the last placed Premier League team didn't get double the income from TV money alone than the entire budget of the richest Belgian pro team. Sidenote: which mods are you using for FM? I'm looking for a good visual mod. I'm tempted to go for another skin, but not taken the plunge yet. So even in the established leagues I’d say it’s difficult if you’ve come from the bottom. I don't think it's too tough to win the PL if you're using a team in one of the Big 5 nations, as there are quite a few lower-league clubs that have the potential to become European giants, with a few years of sustained success. But doing it with a team from, say, the Netherlands is quite a challenge because, as Dave and dejanzie noted, unless something miraculous happens, you're simply not going to have the money or prestige to compete when Getafe comes calling for your best player. Finally through the regular phase of the competition, now into the play-offs! Without play-offs, I would already be champion with 20 points ahead. But in the play-offs only the strong partake, so it's easier to sustain a lead. 10 more games, and I'll have finished my first complete season since CM04/05! I'm not even going to ask about the halving points thing. I suppose it's one way of taking forward 6 teams into a playoff format without doing a full reset (NFL style, where the only advantage you carry forward is home field advantage or a 1 game bye), but spicing things up a bit. Is it just a 5 match round robin, or does everyone play everyone else twice ? It sounds vaguely like what they do in the danish superliga, but they don't loose half the points. And I agree it works well for the top teams but not the playoff places. As it definately makes the later games much more meaningful, as the talent/form level gap from the first 3-5 teams to the bottom teams is quite striking most years. I contend that FM needs a lot more Dumb Footballer Sh*t in the next iteration, because it'd be amazing and would allow for hilarious stuff like this. The 32-year-old midfielder, who is loan from Barcelona at Istanbul Başakşehir, allegedly attacked Turkish singer Berkay Sahin following a failed attempt to pick up Sahin’s wife, Ozlem Ada, on October 10. Sahin alleges that Turan walked up to his wife and said “you’re very pretty, if you weren’t married I wouldn’t let you get away.” When Sahin interjected, Turan allegedly started a scuffle, and the ensuing altercation left the singer with a broken nose. As if that weren’t enough, Turan allegedly then went to the hospital where Sahin was recovering to apologize in the most Arda Turan fashion: by offering him a gun and telling the singer to shoot him in retaliation, reportedly saying, “Shoot me if you want.” Like you would expect a rational human being to do, Sahin turned down the surely-appealing offer from the soccer star, leading to Turan allegedly taking the gun back and firing it off at the floor in the hospital room. The four charges could add up to a 12-year sentence for Turan, who was fined 370,000 Euros by his club for “behaviour and attitude not compatible with the club’s ethics.” Sahin is also facing between three months and two years in prison himself for insulting Turan during the kerfuffle. If they can program in Korean National Service, they can add in this. Hahaha. That's a remarkable story. Yeah, a check box for "truly random events" would add some flavor. I'd like the job writing those up. Some of the older CM games used to have events such as referees being assaulted by players. Real players too! I’m maybe guessing that there could be a potential for court action if they put those things in for real players now. I’d like to see stuff like that more for regens though.